On this the last day of 2015 I wanted to share the words of poets on poetry. 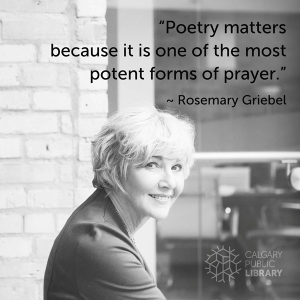 I begin with the image of Rosemary Griebel and her quote on poetry. Poetry as prayer. Something not all poets agree on but many do. And I am firmly in Rosemary’s camp on this one. I begin with Rosemary because of the poetry quote initiative she was part of this April with the Calgary Public Library. (More from that initiative below.) But I want to take a quick detour back to the words of American poet Charles Simic which I came across a few days ago and have included above. I wanted to make sure Simic’s quotes didn’t get lost below. Especially his zinger: The poem I want to write is impossible. A stone that floats. What a goal for any poet! What a challenge for us poets as we think of our stones from 2015 and the ones we we want to write in 2016! Here’s to impossibility: stones and poems that float! Born in Yugoslavia, Charles Simic has lived most of his life in the U.S. He is seventy seven and still going strong! He has won more poetry prizes than the number of books many poets publish in a lifetime and released his twenty first poetry collection this year! Only through poetry can human solitude be heard in the history of humanity. In that respect, all poets who ever wrote are contemporary. My life is at the mercy of my poetry. How Simic sums up the difficulty and thrill of poetry: how to make a stone that floats! And, of course, a great short poem like a Haiku darn near tells us everything. And his idea that it is our solitude that permeates a poem more than in any other writing rings true. The best poems comes from the deep silence. They say themselves out of that silence. That’s why when Simic says: My life is at the mercy of my poetry, I can stand up and say: yes. I cherish quotes on poetry because they are like trying to catch a photon in your hand. Poetry can’t be caught, just seen, and felt! Or as Simic says about the poem he wants to write, writing the definitive quote on what poetry is, is impossible: like a stone that floats! I collect these aphorisms by poets all the time but this year I was delighted to discover that for Poetry Month in April the Calgary Public Library posted poetry quotes by Calgary poets as part of their celebration. I first discovered these through Rosemary Griebel who works there and may have had something to do with this initiative! Some of the quotes from the Calgary Public Library collection have stayed with me all year which is why I wanted to celebrate its initiative and share some of the quotes. For the full months quotes plus poems by the quoted poets click here. Poetry matters because it is one of the most potent forms of prayer. Nothing in a poem is superfluous. It works to lift, enliven, make spontaneous, frighten, inspire, record into memory, and alter the mind. Poetry connects, it rallies, it grieves, it loves, it seduces, it explores, it captivates, it takes your hand in rapture, exaltation, depression, when you’ve loist hope, when you have faith. Poetry is the stuff of life. It will wring you out, then save you. Micheline Maylor, author of three poetry collections including Whirr & Click, Frontenac House, 2013 and editor of Freefall, the Calgary-based literary journal. Poetry, in both its creation and the reading of it, insists on careful listening. Careful listening opens a space for the soul, for revelation, for wholeness. Poems are glimpses of wholeness. In our lives, through the turmoil and uncertainty, poetry gives us beauty and understanding. It cannot solve problems or make them go away, but when I connect with a poem, poetry reveals an introspection and peace to me. Poetry matters because it is transportation, salve, a wall or summit, satisfying to scale, an expression of love, confusion, fury. It is the pwoer cord to our humanity. Without it life would just be a trough of chicken wings, a toilet and fatigue. [Poetry] A way to allow people to feel the meeting of their consciousness and the world, to feel the full value of the meanings of emotions and ideas in their relation with each other, and to understand, in the glimpse of a moment, the freshness of things and their possibilities…There is an art which gives us that way; and it is, in our society, an outcast art. Here is my challenge to the page when I write: Does the notion driving this poem survive translation? Is the craft tight? Would the poem’s rhetorical risk or emotional revelation mean something outside the terrarium of its home culture? Has the poet disturbed the universe? Obituaries for poetry are perishable. So are many poems that will slide into oblivion without needing a push. But the activity of writing them redeems itself even if it is only a gesture toward what we continue to need from literature and the humanities: an experience of mind — mediated by memorable speech — that feeds and sustains the imagination and helps us make sense of our lives. David Lehmann, New York Times Book Review, August 18th, 2014. “The eye with which I see God is the eye with which God sees me.” Meister Eckhart. The experience of making something can include the experience of being made. I believe there is a mystical dimension to the making of a true poem. I know some poets who don’t believe this at all, but I just don’t see how or why they persist with such an arduous art in light of that. I sometimes think art is useless in the face of extreme suffering, but then I remember Miklos Radnoti, Paul Celan, Anna Akhmatova, or Mandelstam—and I bow my head (to them) in awe. I suppose I do believe that the greatest art consoles a wound that it creates, that art can give you the capacity to endure and respond to the pain it forces you to feel. Psychological pain, I mean. This entry was written by Richard Osler, posted on December 31, 2015 at 3:30 pm, filed under Poetry and tagged Calgary Public Library, Charles Simic, Christian Wiman, David Lekmann, Joan Shillington, Juleta Severson-Baker, Micheline Maylor, Muriel Rukeyser, Rosemary Griebel, Weyman Chan. Bookmark the permalink. Follow any comments here with the RSS feed for this post.